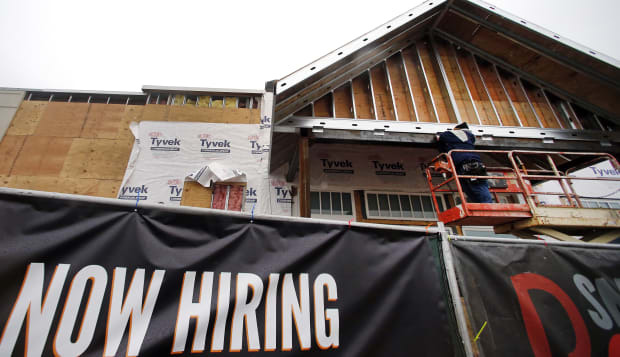 (Reuters) - U.S. employers added the fewest number of jobs in more than a year in March, which could heighten concerns over the recent slowdown in economic growth and delay an anticipated interest rate increase by the Federal Reserve. The unemployment rate held at a more than 6-1/2-year low of 5.5 percent because people dropped out of the labor force. "There's no question that the economy is showing the negative effects of the stronger dollar and the collapse in oil prices. Corporate profits have come under pressure, and hiring has been adjusted in response," said Jim Baird, chief investment officer at Plante Moran Financial Advisors in Kalamazoo, Michigan. Economists polled by Reuters had forecast payrolls increasing 245,000 last month and the unemployment rate remaining at 5.5 percent. Prices for U.S. government debt rose as investors further pushed back their expectations for a Fed rate hike this year. The U.S. dollar fell against a basket of currencies and U.S. stock index futures slipped. The U.S. central bank has appeared keen to raise its key overnight lending rate, which it has kept near zero since December 2008. But the economy's recent softness has led investors to push back bets on the rate lift-off. Some believe the Fed could even wait until 2016. March's tepid increase in payrolls ended 12 straight months of job gains above 200,000, which had been the longest streak since 1994. In addition, data for January and February was revised to show 69,000 fewer jobs created than previously reported, giving the report an even weaker tone. The paltry job gains could fan fears that the recent weakness in economic activity could be more fundamental rather than due to transitory factors. Until last month, the labor market had largely shrugged off a harsh winter, a buoyant dollar, weaker global demand and a now-resolved labor dispute at West Coast ports, which have combined to undermine economic activity in the first quarter. Growth braked sharply over the past three months. Gross domestic product estimates for the first quarter are as low as a 0.6 percent annual pace, but the slowdown is expected to be temporary. There was some good news in the employment report. Average hourly earnings, which are being closely watched for clues on the timing of a Fed rate hike, increased seven cents, lifting the year-on-year gain to 2.1 percent. While the labor force participation rate, or the share of working-age Americans who are employed or at least looking for a job, slipped one-tenth of a percentage point to 62.7 percent last month, other measures on the Fed's so-called dashboard continued to improve. A broad measure of joblessness that includes people who want to work but have given up searching and those working part-time because they cannot find full-time employment fell to a more than 6-1/2-year low of 10.9 percent from 11 percent in February. The number of Americans unemployed for 27 weeks or longer also declined further. Some economists believe that bad weather could have hampered job growth last month, citing a decline in construction payrolls and a sharp deceleration in leisure and hospitality employment gains. The average work week fell to 34.5 hours last month from 34.6 in February. "It is very likely that weather has been part of the story, but the latest numbers bring payrolls more in line with other data that signals some underlying slowing," said Alan Ruskin, global head of G10 FX strategy at Deutsche Bank in New York. Private payrolls increased 129,000 last month, slowing from 264,000 in February. Employment growth was held back by a decline in the goods producing sector payrolls. Construction employment fell 1,000. Manufacturing, which has been hit by the strong dollar and softer global demand, saw payrolls fall by 1,000. Government employment fell 3,000. The mining sector also saw more job losses last month, with payrolls falling 11,000. That reflected ongoing losses in oil and gas extraction, which has taken a hit from lower crude oil prices.